Miranda Ketteler, left, and Ivy Prater. 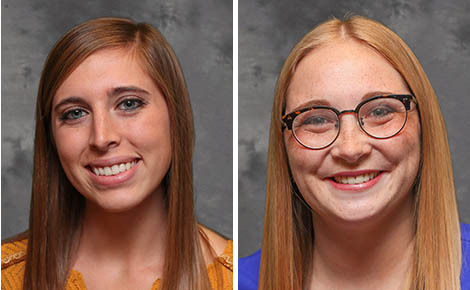 Miranda Ketteler of Petersburg and Ivy Prater of Elgin are among four finalists for homecoming queen at the University of Nebraska at Kearney this week. The king and queen will be crowned at 9 p.m. Thursday, Sept. 14, at the Health and Sports Center. They also will be recognized during halftime of UNK’s football game against Northwest Missouri State at 2 p.m. Saturday, and will oversee other homecoming week festivities. Miranda Ketteler represents the Loper Programming and Activities Council. She is a senior from Petersburg majoring in social work. She is involved in Phi Eta Sigma, Mortar Board, UNK Students for Life, Student Social Work Organization, Phi Alpha, UNK Newman Center, and serves as vice president of Loper Programming and Activities Council. She has volunteered with Loper Leaders and The Arc of Buffalo County. Ketteler is a student researcher with the university, has worked as a student diplomat, and served as a peer mentor for the Susan Thompson Buffet Scholarship Program. She also studied abroad in the Czech Republic and is a member of the dean’s list. Ivy Prater represents Alpha Phi sorority. She is a senior from Elgin majoring in organizational communication with a minor in marketing and management. Prater currently serves as Alpha Phi chapter president, is a student diplomat and UNK’s student body vice president. She stays active both on and off campus through The Kearney Area Friends Program, intramurals, Mortar Board, Lambda Pi Eta Communication Honor Society, Gold Torch Society, Order of Omega and Phi Eta Sigma. Prater interned in Washington, DC, the past two summers and after graduation will pursue a career in grassroots advocacy. Finalists were selected by student vote. The final round of voting takes place this week.